Beautiful 4 Bedroom, 3 Baths, (Sleeps 8-10) on golf course, updated, & more. SPECIAL! NIGHTLY RATE REDUCED!! 3 night minimum. Amazing Family Holiday Home! Beautiful, spacious, light, bright, and inviting! This Non-Smoking home has been recently remodeled with a wall of French windows and doors looking onto the Eagle Vail Golf Course with a spectacular view of the mountains. Relax and enjoy the peaceful setting in this professionally decorated 'Ralph Lauren' style decor with new hardwood floors. Less than 10 minutes to either Vail or Beaver Creek ski slopes. It is a very convenient location close to the Echo bus line, restaurants and much more. The gourmet kitchen has slab granite countertops, stainless steel appliances, and the bar counter is open to the living room with a woodburning fireplace, vaulted ceiling, and large dining area. Open the French doors onto the deck and enjoy the views and serenity of the beautiful Colorado days and nights. The large master bedroom has a king-size bed and private full bath with slab granite countertops. The second bedroom has a queen-size bed and adjacent full bath with slab granite countertops . Downstairs you will find an additional living area with second TV plus recreation area with wet bar, pool table, ping pong table, foosball table and dart board. Bedroom #3 has a queen-size bed and Bedroom #4 has two twin beds. There is a full bath with slab granite countertops and laundry area with a washer and dryer for your convenience. Enjoy the huge deck and yard backing onto the Eagle Vail Golf Course. Wifi and hi speed internet, too. Don't miss this opportunity to spend your special holiday, Christmas, New Years, ski week or summer or fall in one of the World's Premiere Ski and Vacation Resorts. It will be a holiday to always cherish! Updated!Great location backing to the Eagle Vail Golf Course. Huge Deck! Downstairs has its own family room, TV, Pool Table, Ping Pong Table, Foosball Game plus 2 bedrooms and full bath. Laundry within the home. Kitchen is stocked with many basic supplies. 6 minutes to either Vail or Beaver Creek. This is an amazing holiday home. New 3/4 bath in master bedroom with Euro glass doors, full bath adjacent to Bedroom 2, full bath for Bedrooms 3 and 4. Backs to the Eagle Vail Golf Course - 2nd ladies tee. Stainless steel range with convection oven. New Viking stainless steel built in space saver microwave. Many basic kitchen staples in the cabinets. Full kitchen with many basic kitchen supplies and items. Great deck looking onto the Eagle Vail Golf Course. Ping Pong, Foosball table and full size Pool Table, plus games in the closet. In the garage are snow sleds for your use. Thank you, Phyllis, for allowing us to stay in your home! Our family thoroughly enjoyed the games and the kitchen was well stocked for our tasty treats. We also loved your beds and shower pressure! Your home is located in a great place and we had plenty of parking. We will see you next year! I am so glad you and your family had a wonderful time. We look forward to seeing you again. Have a wonderful new year. 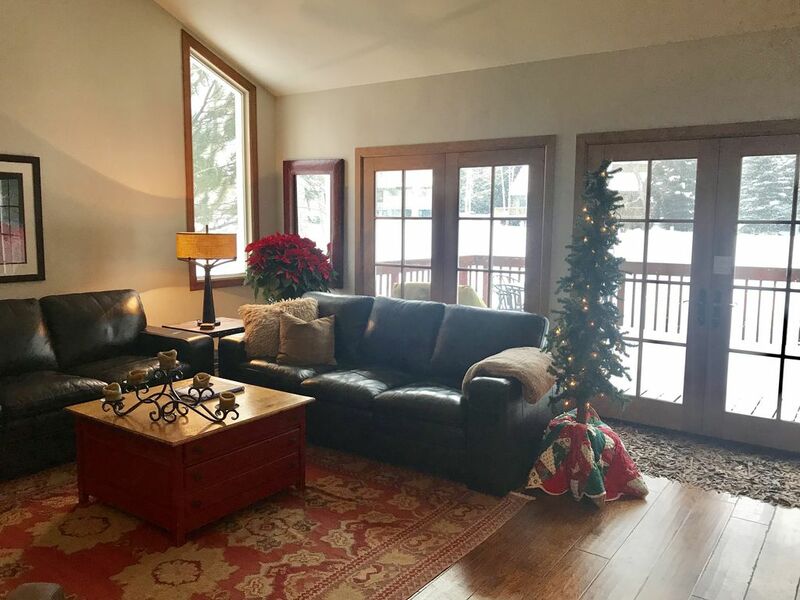 3 couples and our kids had a wonderful ski trip with our kids having a place to play and watch movies downstairs and the adults having space to gather in the great room for good and drink. Barbecue available, nice wood burning fireplace, kitchen with everything you need and parking for 3 cars. The owner Phyllis is very nice and communicates well. My husband, daughter, son-in-law, son, and I spent several nights at this condo in February. The unit was clean, comfortable, and gracious, with plenty of comfy living room furniture, a nice dining room table and chairs, and a kitchen with plenty of counters. Each bedroom was quite luxurious, and we all enjoyed the games in the basement (foosball and pool). The living room was bright with plenty of natural light from the floor to ceiling windows. We have skied for years and rented various condos, but this one was the very best. Great place, kids loved it! We had a great trip and this duplex was great. Plenty of room for everyone, and my kids played pool in the basement every evening. The owner had firewood waiting for us, and gave us access to sleds as well. Kitchen was large, wifi good, TVs in working order. We would definitely consider staying here again. Also, drive to Vail was only about 6 minutes. The house was terrific and was centrally located to everything we wanted to do! The house was clean and comfortable and just as described. The kitchen was well stocked with utensils and spices, which was a nice touch! Phyllis was great to work with and made it a very pleasant experience. I would highly recommend this property and hope to be back in the future. We enjoyed a lovely stay here over Christmas, and 2 families and a grandmother were very comfortable. The kitchen was excellent, and well-equipped. Upstairs has 2 bedrooms & 2 baths, living room, kitchen, while downstairs had another 2 BR/1 BA + family room. Downstairs also has a pool table (put the top on to make a ping-pong table), foosball, and laundry. The downstairs family room was ideal for the teenagers in the group to hang out, while others could have conversation and a fire upstairs. Note that the MBR has an air mattress in the closet which we only noticed upon leaving, and also there are games and puzzles in a downstairs closet. We borrowed the sleds from the garage, and found an awesome sledding hill on the golf course about a 15 minute walk to the West. Note that there is not a free shuttle to Vail or Beaver from the house, and parking at Vail is $25/car per day. Also, the house is a duplex, but apparently very well built, as we never heard any noise from the adjoining side - they are connected only by the kitchen/dining room, which probably helps. A couple of things need updating (TV and remote, ping pong paddles), but these were not important to our enjoyment. We loved Vail and this was a great jumping off point - would definitely stay here again - must be gorgeous in the summer! World Class Shopping, Gourmet Restaurants, Spa, Whitewater Rafting, Snowshoeing, Jeep Tours, Kayaking & Less than 10 minutes to either Vail or Beaver Creek with convenient Bus Service. $250 fee for final cleaning, if extra cleaning required it will be charged to renter.